In The Drawing of the Three, the second of Stephen King’s 7-book series The Dark Tower, the Series’ main character, Roland Deschain, comes upon a door standing on a beach. The door is not visible from the other side. To walk through this door is to enter another world. 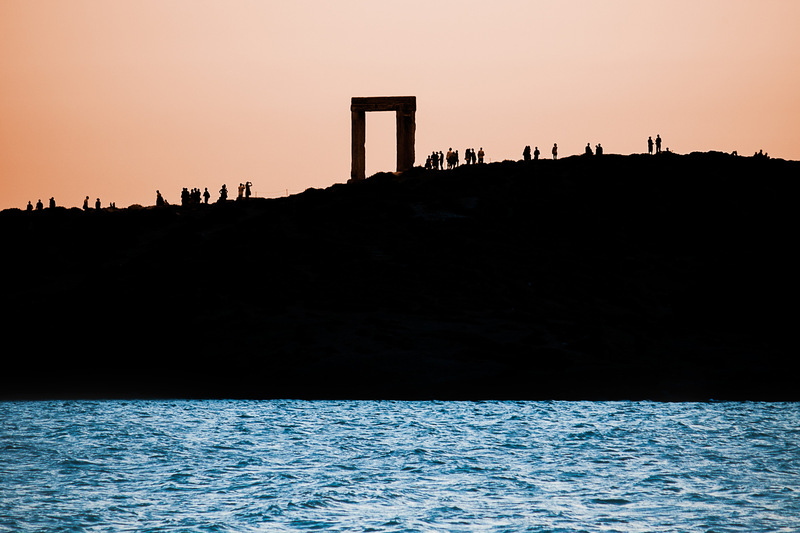 The Portara, which literally means “huge door,” on Naxos reminds me of King’s doorway on the beach, and who knows, maybe he got his inspiration for it from the Portara, which has been standing on an islet just off the harbor of Naxos Town for more than 2,500 years. This free-standing marble door frame seemingly leads to nowhere. 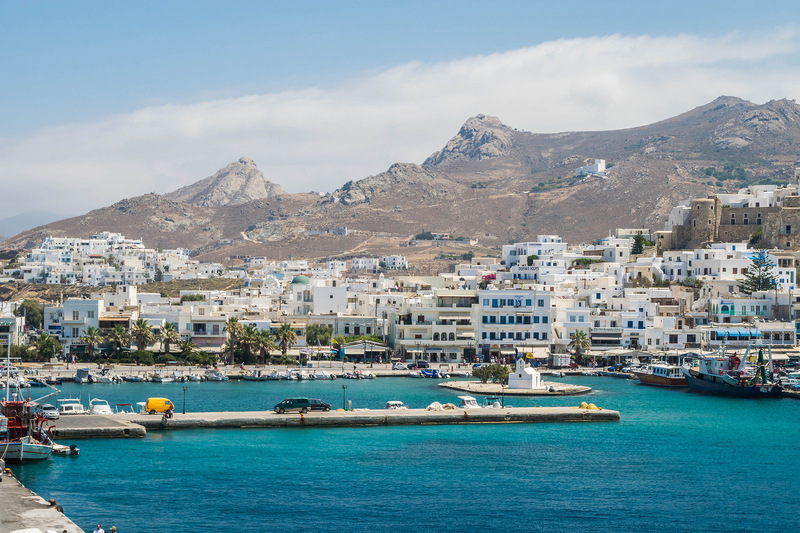 It’s the most prominent structure a visitor to Naxos sees as the ferry pulls into the harbor, standing impressively on a hill as it has for so many centuries, alone, mysterious, exerting its strange attractive pull. The Portara, insofar as we know, is a door that leads to nowhere. The hill is stands on was once connected to Naxos but time and tide has turned it into an island which has been re-connected to the mainland by a pedestrian causeway. The doorway is oriented towards the sacred isle of Delos, birthplace of Apollo. Therefore the most accepted theory of the building that was once connected to the door was a temple dedicated to Apollo. However, the most celebrated god on Naxos was Dionysos. Naxos and Delos had a close relationship then, Naxos being only 30 kilometers from Delos, with Naxos being the strongest power in the Cyclades. The Portara’s connecting temple, which was never finished, was begun around 530 BC by the island’s tyrant, one Lygdamis, who was something of the modern city mayor with respect to the town and island he governed: his desire was to make the buildings of Naxos Town the tallest and most beautiful in Greece (For historical point of reference, this was a few decades before the Parthenon was built.). Greeks, never being ones for letting a classically–designed and constructed temple go to waste, converted the temple, whether finished or unfinished, into a church. The temple’s physical demise occurred during the late Middle Ages when it was taken apart piece by piece, some of its marble used to built one of those Venetian castles that dot the landscape in so many Greek islands. Perhaps the Venetians let the Portara stand as a lonesome reminder of the grandeur of the temple of which it was once the entrance. The Portara’s profile, high on a hill jutting into the sea next to the harbor, is the first significant man-made structure every visitor to Naxos sees as his ferry heads for the harbor landing. Its height is 8 meters, very high for an entrance door of any kind. Its mass is accentuated by how few pieces it is made of: just 3 blocks of marble, each 16 feet or 4.9 meters long with a weight of 20 tons each. That the Portara was perhaps never connected to the building it was designed for could account for the fact that the projections used to lift the blocks in place, called tenons (which are hammered off after the block is exactly where the masons want it), where never in fact removed, leading one to suspect that the temple, as a church, was perhaps unroofed, which, in the mostly sunny climate of the Cyclades, would not have posed much of a problem. The surviving portions of the foundation and floor fix the temple’s dimensions at 55 x 24 meters, or 181 x 80 feet. They assume, in accordance to standard temple architecture of that era, porches front and back and a double-colonnaded inner sanctuary. 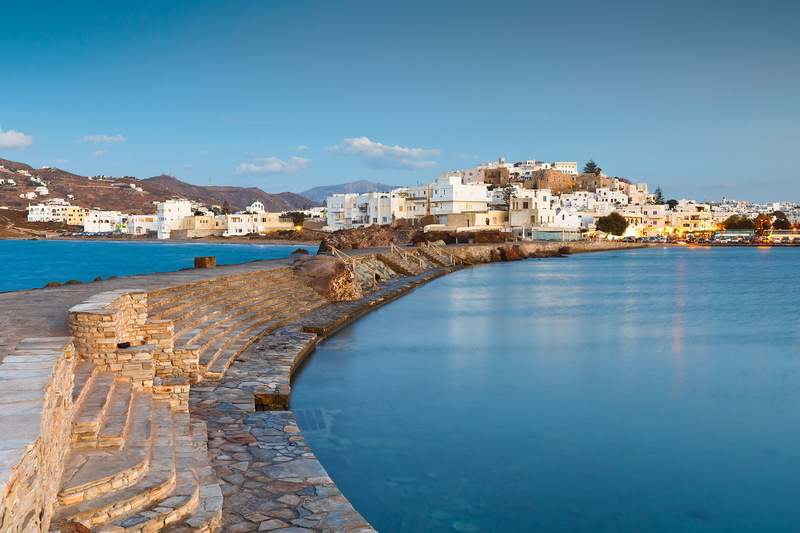 Naxos is a place that wouldn’t mind at all attracting the volume of tourist trade that nearby Mykonos has attracted. Be that as it may, the Naxians survive. They fish, they farm, and they remain far more Greek than Mykonos, with its floods of foreigners. Naxos is a place much closer to self-sufficiency than other Aegean islands. It’s not just that it is large, but it has a good water supply, and relatively ample vegetation, allowing abundant crop cultivation, and the raising of livestock, chiefly sheep and goats, which feed the native population. It’s pace is slower, its atmosphere more restful, it’s feel for the rhythms of the days and seasons more accurate and therapeutic. Mythology tells us that Zeus was raised in a cave on Mount Zas, or Mt. Zeus (by the way, for those who are interested, the proper Greek pronunciation is “Zefs.”) There is a cave on the island, Zas cave, where archeologists have found different objects, including a dagger and a sheet of gold. There are a couple interesting, conflicting stories about Naxos’s mythological history. The first leads to Cretan maiden Ariadne’s suicide. The second myth ends with the god Dionysus marrying Ariadne. Both myths begin in the same way: Ariadne was the daughter of King Minos of Crete. Minos, having defeated the Athenians in battle, had demanded an annual tribute from Athens of young men and women to be sacrificed to the horrifying half-man, half-bull who lived in the labyrinth at Knossos. Enter Theseus, Athenian hero posing as a victim, but really on a mission to dispatch the Minotaur. Ariadne falls in love with him at first site, and provides Theseus with a ball of twine which he unravels to keep from getting lost. The Minotaur dead, Theseus and Ariadne flee to Naxos, where Theseus promptly deserts her. At this point the stories diverge: In the first case, Dionysos, apparently hanging around Naxos with nothing else to do, falls in love with forlorn Ariadne. This leads to the suicide of Ariadne because she’s a one-man woman: it’s either Theseus for her, or no one. The story is so compelling that Richard Strauss wrote an opera (Ariadne auf Naxos) about it. The second version has Ariadne accepting Dionysos’s overtures and marrying him on Naxos. This second is the preferred version of Naxians. Artifacts show that Naxos, largest island in the Cycclades, had a settled population as early as 4th century BC. Naxos, some say, was the king of the Carians, who settled there, as well as on many Aegean islands during the Neolithic period. By the 3rd century, Naxos had developed a unique culture featuring the now-iconic Cycladic sculpture, most of which were spare, minimalist representations of standing figures made of marble. The Minoans of Crete made their influence felt during this period, the middle centuries of the Bronze age. After that the Mycenaeans of the mainland Peloponnese had a great influence on the art and architecture of Naxos. 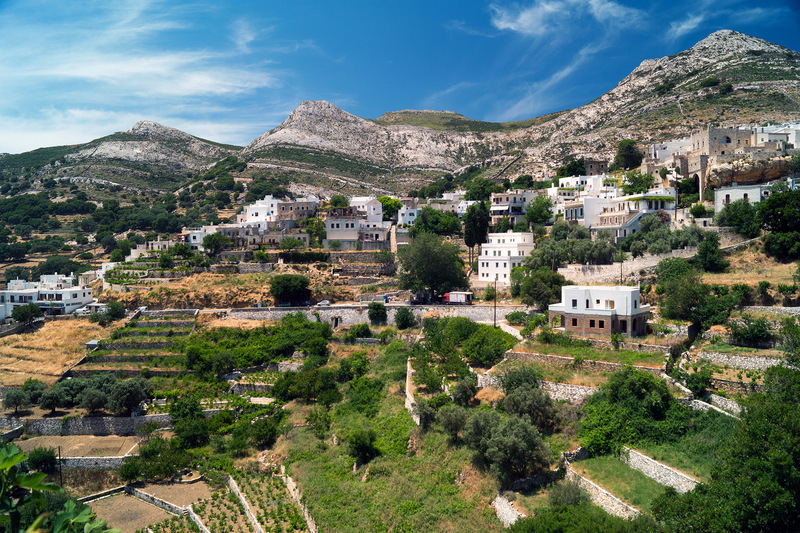 Ionians settled the island around 1000 BC. Because of its export trade in marble and other products, Naxos was the leading Cycladic trading power during the 8th and 7th centuries, BC, and even founded some colonies. They founded, along with Chalcis (Halkida), a city named Naxos on Sicily in 735. More evidence of Naxos’s power and wealth is seen in the various monumental dedications such as the famous lions of Delos, and the Sphinx ay Delphi. Naxos reached its high point under its aforementioned tyrant Lygdamis (545-524 BC), who, with the help of his ally Pesistratus of Athens, commenced an extensive building program. In 530 BC the (probable) temple of Apollo was started, but never, as we have learned, completed, the Portara standing as a haunting reminder of what was to be one of the greatest buildings in antiquity. 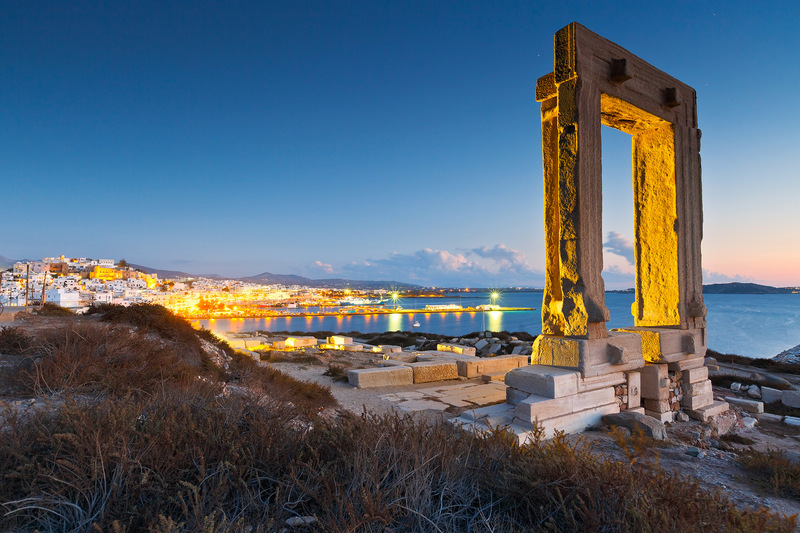 Around 500 BC Herodotus, Father of History, described Naxos as the most prosperous of all Greek islands. Size, its marble quarries, and its central location, had a lot to do with it. It was also the center of archaic Cycladic culture. In 502 BC the Persians invaded. The Naxians turned them back. The Greeks of Ionia, who had settled in modern western Turkey, on the shores of the Aegean, took encouragement from this and rebelled against their Turkish masters. The support of this rebellion by Athens and other city-states led to the Persian invasion of Greece, and the battle of Marathon, in which a superior Persian force was routed by Greeks at Marathon in 490 BC. On their way to the battle, the Persians sacked Naxos, enslaving its citizens. For this reason Naxos supplied triremes for the naval battle of Salamis 10 years later. In 474 Naxos joined the Delian League, a sort of ancient version of NATO. This confederacy of 150-plus city states had been cobbled together to resist Persian aggression, after the stunning Athenian-led victories at Marathon and Salamis. Just a few years later Naxos rebelled against the League, feeling the Athens-led confederation had begun to levy burdens on its fellow states that those states thought were out of line. The Romans took the island in 41 BC, succeeded by the Byzantines, who turned most of the pagan temples of Naxos into churches during the 6th century AD. After the 4th Crusade (1202-1204), after the Venetians took Constantinople, The Cyclades fell to Marco Sanudo, nephew of the Doge (military ruler) of Venice. Using Naxos as his base Sanudo carved out the Duchy of the Archipelago from the Byzantine Empire. The Duchy promoted Venice’s interests in the Cyclades and included all of its islands except for Tinos and Mykonos which were controlled by private citizens of Venice. With Naxos as the Duchy’s capital, the Venetians ruled until 1566. The Ottoman Empire was content to let the Venetians administer Naxos for them after they took possession of the island in 1564. The Ottomans controlled the island until the Greek Revolution of 1821. Naxos became part of the modern Greek state in 1831.